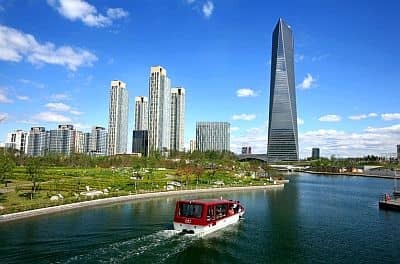 In Incheon, a Korean city, located in the northwest of the country, on the coast of the Yellow Sea and a short distance from Seoul, the climate is continental: winters are very cold but sunny, and summers are hot, sultry and rainy, though tempered by the breeze. Like the rest of Korea, the city is affected by the monsoon circulation: in winter the northwest cold currents prevail, while in summer they are replaced by hot and humid currents of tropical origin. Spring and autumn are transitional periods, mild and pleasant, especially the month of October. The climate is very similar to that of Seoul, however, owing to the location on the coast, it is a bit milder (less cold in winter and less hot in summer) and also less rainy. For example, in January 2011, in Seoul the temperature dropped to -18 °C (0 °F) and in Incheon to -15 °C (5 °F); in January 2016, it dropped to -18 °C (0 °F) in Seoul and to -16 °C (3 °F) in Incheon; in August 2016, it reached 36.6 °C (98 °F) in Seoul and 34 °C (93 °F) in Incheon. In winter, the average temperature is around freezing (0 °C or 32 °F) or a few degrees below; sunshine is quite common, and a cold wind often blows from the Asian continent. On colder periods, the temperature remains below freezing during the day; in the worst moments, it can drop to -15 °C (5 °F) or below. Although winter is a dry season, sometimes it can snow. In winter and especially in spring (March to May, which is called yellow dust season), the city can be reached by the yellow dust (HwangSa in Korean), which comes from the desert of Mongolia and from China (but in truth there is also a contribution given by local pollution) and forms a characteristic haze; it can also cause breathing problems and eye irritation. Spring is mild, but the rains increase gradually. However, because of the monsoon, the rainiest season is summer: from June to August, more than 700 millimeters (27.5 inches) of rain fall. The rains can sometimes be torrential. The worst month, the wettest and least sunny, is generally July. In summer, there can be periods of good weather as well, which can be very hot, with highs about 35 °C (95 °F). In Autumn, rainfall decreases, and by October the rains are already quite rare. Here is the average precipitation. From July to early October (and occasionally also in the second half of June), Incheon can be affected by typhoons, the tropical cyclones of South-East Asia, although this area of Korea is less exposed than the southern coast. The amount of sunshine in Incheon is decent in winter and also in spring and autumn, while it reaches its minimum in July, when cloudy skies prevail (and the amount of sunshine drops to 35%) because of the summer monsoon. In Incheon, the sea is very cold in winter, but it warms up a lot in summer, reaching 24 °C (75 °F) in August.